good story but very slow. Husband fell asleep. I have to agree with the majority of the reviews .... kind of slow going story line . The true bank robber the movie was based on ,apparently led a pretty colorful career , why not show some of it in the movie ? A good idea for a movie ,was a fail in my opinion . Disappointing. Nothing really there except decent, not extraordinary acting, and a shallow plot/story line. Missable. This was hugely disappointing and boring, boring, boring. It was slow, common thief addicted to bank robbery,acting was good, spacek looking good. Sorry, dullesville. Not much of a story line. I loved the main characters Redford & Spacek! Another of those cases where that would be 3 1/2 stars if I could have. Good low key look at a guy who had a real passion - for robbing banks. If I were him, I'd have taken the woman. But that's the point; he just couldn't relinquish his passion. It reminded me of Zodiac and Hell or High Water in tone, but is much easier to watch. Like I said - low key. If Robert Redford really does decide to pack it in, he exits on a very good note. 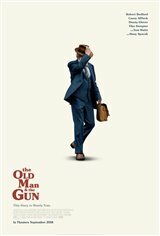 But that's what Clint Eastwood said after Gran Torino (and I am looking forward to The Mule). So ... we shall see. Passion, and all that jazz. Very weak story line although the acting was decent. Should be a one hour T.V. movie.